Five scholars will be portraying these characters at the upcoming Ohio Chatauqua. 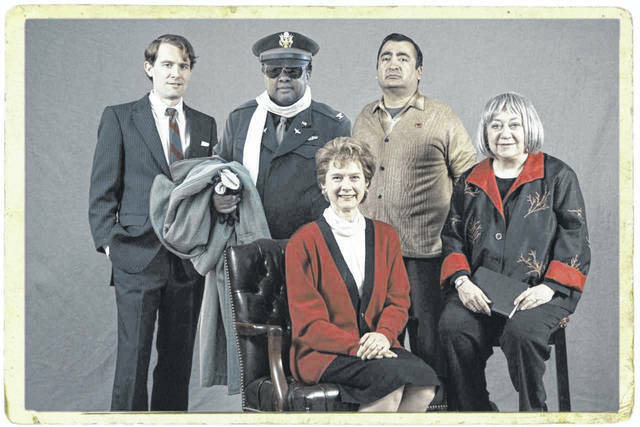 From left: Jeremy Meier as Robert Kennedy, Jim Armstead as Benjamin Davis Jr., Susan Frontczak as Erma Bombeck, Fred Blanco as Cesar Chavez, and Sally Drucker as Betty Friedan. GALLIPOLIS — History is set to come alive in the Gallipolis City Park for the 2018 Ohio Chautauqua. While Chautauqua is historically known for portraying history from a long time ago, this year features five characters many still living would remember. The five day event will bet held June 12-16 and features workshops during the day and feature events in the evening. The theme for the year is “Modern Legends” and features persons that came to represent the ideals of justice, liberty, and equality, according to Ohio Humanities Director Patricia Williamsen. “From 1968 through 1973, America was torn between its ideals of liberty and justice and its reality as a country deeply divided by war, by race, by politics, and by individuals demanding that America live up to its promise for equality,” said Williamsen. Friedan was known for her work in feminism, as each of the five characters were known for representing some aspect of society at their time. Benjamin Davis Jr. was the first African-American general officer in the U.S. Air Force. Cesar Chavez was known for pursuing reform in workers and civil rights as a union leader. Erma Bombeck was known for her writing and column in post-war America and represented the suburban housewife. Kennedy was pivotal throughout the political atmosphere during the 1960’s. The week-long event features workshops with the scholars each day as well as a portrayal and question and answer time with each person in character encouraging public participation. According to Saunders, audience participation is very important this year because many still remember the times when these characters would have been active and involved in society, adding another level to the interaction. “It’s a wonderful time to interact with the scholar during the day at the workshops… and then under the big red tent in the Gallipolis City Park in the evening,” said Saunders. This is the seventh time that Gallipolis has hosted the Ohio Chautauqua since 2006. To learn more about the upcoming event visit Bossard Memorial Library in person or online at bossardlibrary.org.